When we launched our new design-led, contemporary carpet range called “Urban Myth”, we took the opportunity to take on four ‘urban myths’ within our own community in nearby West Gorton, Manchester. 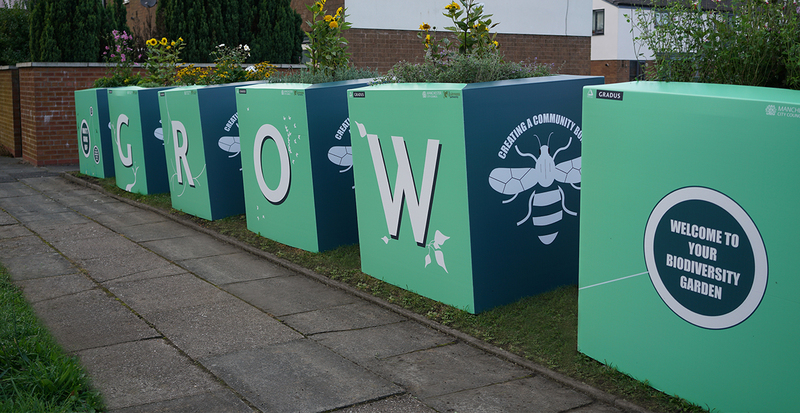 Working in partnership with community charity, Groundwork; Manchester City Council and The Guinness Partnership, we brought the local community out to have hands-on involvement in the creation of a pollinator garden. The purpose of the mobile biodiversity initiative is not only to increase the biodiversity of the residents’ local environment, but also dispel the myth that people don’t value green spaces. Local residents were actively involved in the creation of the containers in which the plants have been arranged. They are wrapped with a variety of educational messages to reinforce both the value of the garden’s creation and its ongoing contribution to the local community.